I took this picture yesterday while we were outside. It was a beautiful day yesterday, It was not too cold and too hot. 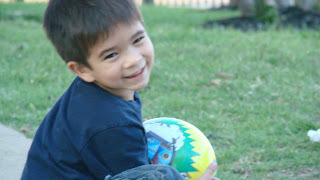 I let my son ride in a bike yesterday and played with ball while I take pictures of him. Samuel likes to take pictures of him. He knows how to pose and listen to my instructions. I am glad he's not a camera shy boy!